You can react to each news item. Click on Comments. Nowadays you find the same stores everywhere, no matter the city, no matter the country, very dull. For about a year or two I was visiting the city of Dordrecht which is located near Rotterdam and I ran into an exceptionnal shop and curiosity drew me inside. It was a shop where they only sold pop-up books. These are books which reveal unexpected three dimensional scenes or structures when you open the pages. Despite the fact that these books are somewhat fragile they are often destinated to children but there are exceptions. In the shop I found a very special pop-up book by the American illustrator David A. Carter with the title "600 Black Spots" (ISBN 13: 9781416940920). The picture shows the book lying open with the pages entitled "Mondrian floats with Shadows and 60 Black Spots". In fact the book is more a piece of art than a book and I decided to buy it as it perfectly in line with my own geometric creations. Back home, searching on the internet, I found out that this mister Carter is one of the leading creators of pop-up books. At the occasion of the opening of a public library in my village Weyersheim (20 km North of Strasbourg in France) in March 2019 I had the pleasure of showing my latest artworks, the Archi-Minis, right beside the most beautiful pop-up books. As often in life, previous experiences and encounters create new experiences. The 18th October 2018 I received a warm welcome from HansChristiaan Peters et Etta Adriaanse, the owners of Galerie Stijl in Eefde in the East of the Netherlands near Arnhem and the german border. Their art gallery is specialized in contemporary abstract art with a preference for geometric art. I've been following the gallery from a distance for more than a year, during this period they moved from Arnhem to Eefde where did a marvelous job tranfsforming a garden center into a spacious art gallery which also houses an art foundation. There is a really nice and large terrace where you can drink tea or coffee and admire the beautiful garden with modern sculptures. During my visit there was time to show my latest creations, the Archi-Mini's. The gallery owners liked them so much that they decided to to take them in deposit for exhibition. From now on I'm represented by 2 art galleries in the Netherlands. For a dutch artist working in France that means in terms of football a score of France 0 - Pays-Bas 2 ! Link to the gallery (in dutch) by clicking on the logo. Lots of success Etta & HansChristiaan, let's visit Galerie Stijl! Months ago I launched the idea of creating a series of very pure, monochrome and also mysterious 3D-paintings or wall objects. Today I can tell you that again one of my strange visions has become reality, a new series of seven bizarre artworks has come alive. I gave the varnish some time to harden and now it is time for the next phase, taking pictures. When it comes to photograhphy you have to watch out for your budget! The equipment is quite expensive and the budget can explode rapidly. A poor artist like me (and there are many others) therefore needs to improvise as the picture shows. Using a window blind from a well known swedish furniture shop spreaded out over some transport cases and the stairway barrier I hope to be able to make some correct pictures for publishing and the internet sites. As a royal reader of my blog you have the first glimp on one of these new artworks. Standing straight in front of this painting (also valid for the other six) you will only see a purple rectangle. All the rest, the secret part, is hidden behind the central purple rectangle placed at a distance from the background. This new series will have a title that could have been the title of a new Harry Potter book: "The Secrets of the Purple Rectangles". In France we have a famous number: 36. If you have seen some french police series and especially some old french gangstermovies from the sixties/seventies with actors like Alain Delon and Lino Ventura, 36 might sound familiar. At no. 36, quai des Orfèvres in Paris you can find the police headquarters where the interrogations took place and from where actions against criminals were planned. Today, 7th September 2018 again something is planned at number 36. This time it is not in Paris but near Strasbourg at number 36, rue de la Dîme. A few days ago I received a very positive e-mail in the mailbox from an art collector in Pasadena, California who ordered 4 Archi-Minis. With a big smile on my face I started packing and filling-in the paperwork for Customs. You have, for instance, to deliver a declaration about the artworks to be exported in which you state if it concerns original artworks, the year of creation and even if the artist is still alive! The Archi-minis are well packed, paperwork is in order and now it is up to the driver to pick them up. There are now 12 Archi-Minis to chose from! And here they are as promised, the new Archi-Minis, placed on a beautiful support made of ash wood they look even more better. While "upgrading" these small architectural art objects I created 5 new. In total the collection counts 12 differents models now. I would say choice enough, pick one out! 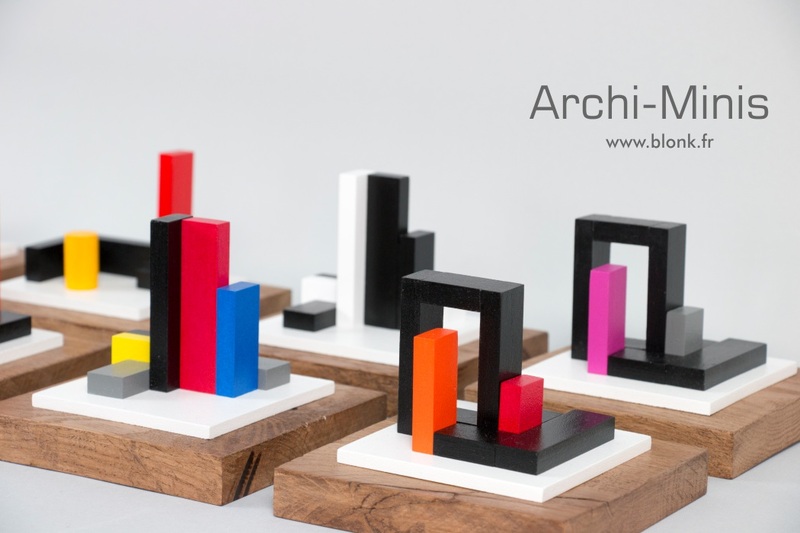 I created every Archi-Mini by hand which means that every Archi-Mini is practically unique although they are made in serie (limited edition). Each copy carries my signature and the branded BlonK-logo. As the new Archi-Minis with the wooden support look quite different today, I had to take new pictures of the existing models which took me more than two days including the editing work. As from today you can find all the members of the Archi-Mini family on this web site by clicking on: Archi-Mini Collection. You see and hear from me again shortly through a video presentation. Keep coming back, buy art and thanks for your attention.